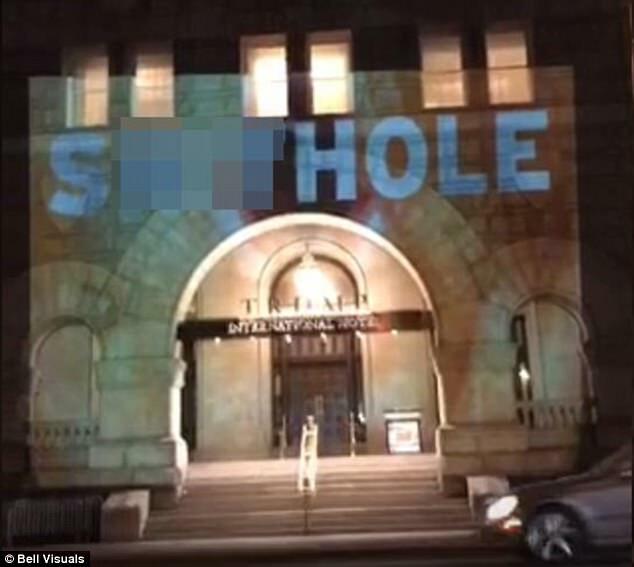 A multimedia artist used a projector Saturday to light up the front of Trump International Hotel in Washington, D.C., with images of floating ‘poop’ emojis and the word “s***hole” in bold, blue letters. The artistic protest came in response to alleged comments made by President Donald Trump during an immigration meeting with legislators on Thursday. During the meeting, lawmakers reportedly suggested granting visas to people from Haiti, El Salvador and countries in Africa. In response, Trump allegedly said, “Why are we having all these people from s***hole countries come here?” He reportedly added that America “should have more people from places like Norway.” The comments were reported by multiple mainstream news outlets. A firestorm followed, with Trump being called insensitive and racist. Trump has denied making the comments. Media called the commentary a major setback to negotiations on DACA, the Deferred Action for Childhood Arrivals program that expires in March. There are about 690,000 young adults protected under DACA. Often described as Dreamers, they are undocumented immigrants who came to the United States as children. On Twitter, Trump denied making the comments about the other nations. In another tweet, he denied saying anything negative about Haitians or Haiti. “Never said anything derogatory about Haitians other than Haiti is, obviously, a very poor and troubled country,” Trump tweeted, and suggested he should record future meetings so his words can be proven. Rep. Mia Love (R-Utah), a Haitian-American, called Trump’s alleged remarks hurtful and unkind.